I now attend my share of groundbreakings, which in themselves are not that interesting. But what they mean to residents often is. The latest case in point comes from Thursday’s event in the Cornerstone development. 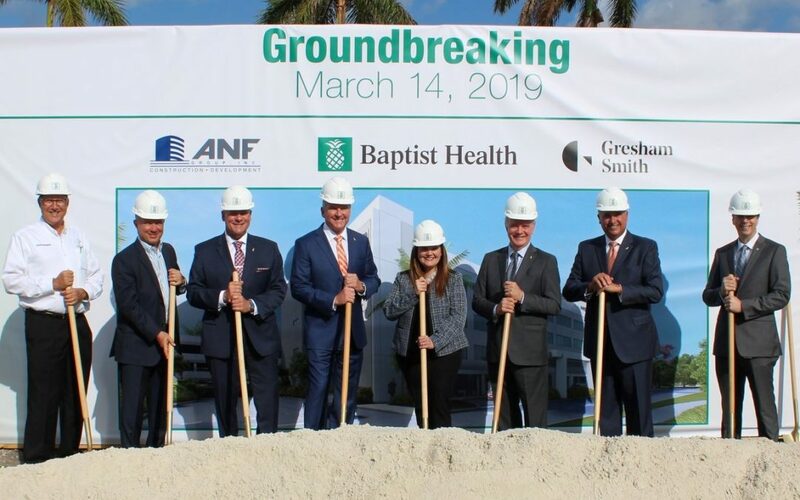 Baptist Health is beginning construction on what they call an “outpatient facility.” Those words kind of make me stumble, but the way they explain it, they wanted to be in Plantation, because – not surprisingly – the geography is in our favor. Baptist Health hospitals now span Broward, Miami-Dade and Palm Beach counties. The larger hospitals diagnose patients who have cancer and perform major surgeries. And those larger motherships for your particular medical issue could be more than an hour’s drive away. So Baptist Health is building about 20 facilities across the area such as the one we’re getting. This one will include urgent care, diagnostics, radiation oncology, sports medicine, physical therapy and primary care. By placing a four-story, 114,000-square-foot building here in Plantation, that regular chemo appointment becomes more convenient. My take is that such an “outpatient facility” is an attraction for someone looking for someplace to live, and patients are generally happier in outpatient settings. “People don’t like to be in hospitals,” Steven Ullmann, professor of health-sector management and policy at the University of Miami, told The Miami Herald in this article detailing the medical trends. Let’s add a paragraph of context here: Medical care and related businesses are growing. We took a hit when it was announced the Plantation General Hospital on State Road 7 was moving to Davie. But Westside Regional near Broward Boulevard and Pine Island Road is expanding both in terms of care and beds, and now this. And having medical care is vital to having a complete city. For the record, the city approved the Baptist Hospital project more than two years ago. Construction will finish maybe by the end of 2020. To find this one, turn south off Peters Road like you’re going to Bokamper’s but instead of turning right, turn left and drive toward the DHL building. About 1,000 community leaders, elected officials and others gathered at The Signature Grand Friday for a morning of information coordinated by Broward Workshop, a non-partisan business organization consisting of chief decision-makers representing 121 of the county’s major businesses and professions. As usual, I found the most applicable information coming from Tony Carvajal, executive vice president of the Florida Chamber Foundation. He looks at the numbers of where the state, and Broward County, have been and where we are going. This year’s presentation from Carvajal especially matters to Plantation, because we are not only trying to keep chugging along today but we want to have a plan for 10 years from now. His biggest stats: Broward County will be adding 400,000 more residents by 2030; transportation is still viewed as the biggest problem we are facing; and the probability of a recession in Florida has increased to 17 percent from its usual 5 to 9 percent. But some good news is that because of such onerous tax conditions in other states, more wealth is being transferred to Broward County. After the $6.2 billion gained from Miami-Dade last year (that one’s obvious), we obtained $500 million from Queens County, N.Y.; $390 million from Nassau County, N.Y.; and $384 million from Cook County, Illinois (that’s Chicago). We’re also getting more diverse jobs in Broward, such as in logistics, aviation and electronics. The city council meets at 7:30 p.m. Wednesday. The agenda is available via https://plantation.novusagenda.com/agendapublic/. The major item is another attempt to put together legislation on vacation rentals. The city Parks and Recreation Department offers the inaugural “Touch a Truck” event, from 9 a.m. to noon Saturday at the Plantation Equestrian Center, 1451 NW 118th Ave. (That’s next to Volunteer Park.) The first hour will be “horn free” – not everyone can handle being blasted with sound – and vehicles include a police car, fire engine and construction truck. Call 954-476-4316. A new exhibit, “America in the ‘60s: The Times, They Were a-Changin’” has opened at the Plantation Historical Museum, 511 Fig Tree Lane. The display will be up through Oct. 5. Admission is free. Call 954-797-2722.